“We are witnessing new walls between European countries”: Marlène Rene and Natalia Klimenko are very realistic when it come to the current state of the continent. However, they are also willing to take action and change it for the better. That’s why they proposed “Borderless Europe – Can we dream that big?” as topic for AEGEE’s next European Planning Meeting (EPM), which will take place from 8th to 12th March in Yerevan, the capital of Armenia. The two enthusiastic Content Managers of the thematic part of the EPM told the Golden Times what motivated them to take up that challenge – and why this event can have a huge impact on the network, including many thematic follow-up events. Golden Tims: What motivated you to apply for content manager? Marlène: I see this event as a chance to raise awareness about Eastern partnership issues – and to wake up people to start caring about issues of European integration which is AEGEE’s core idea! EPM Yerevan, the first statutory event that far East, it is a marvelous opportunity! The South Caucasus is a region full of contrast and I am passionate about these issues, and as I talked to my friends, they gave me the idea to propose a theme. Natalia got really enthusiastic as well and we made the proposition together! The thought of being in Yerevan, of all the opportunities that we have as Youth, still makes me jump of excitement. 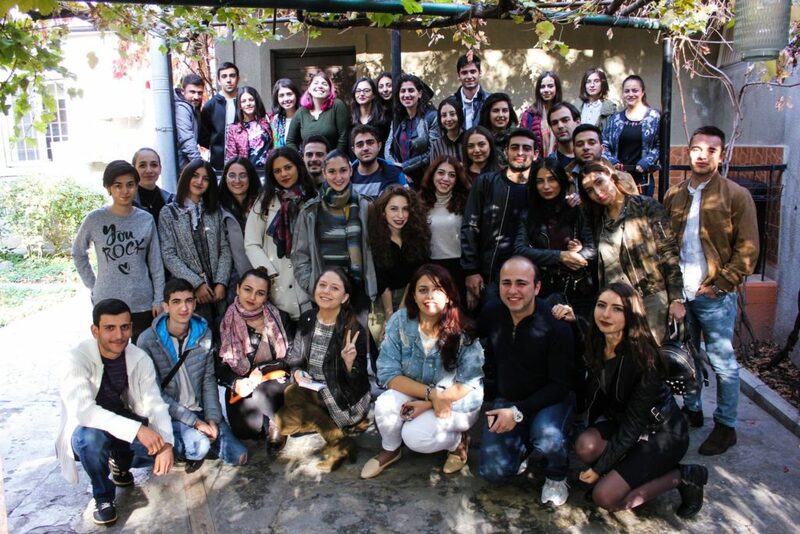 Working with AEGEE-Yerevan is also important. They are a young and enthusiastic team and I know we have each other’s support. GT: Can you explain the EPM conference topic in a few sentences? What is the Eastern Partnership (EaP), what is the EPM conference about and what is the expected outcome? 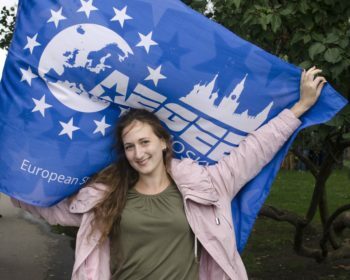 Natalia: “Borderless Europe – Can we dream that big?” embodies the objectives of AEGEE as such: striving for an integrated Europe without borders. As idealistic as it might sound, we as young people cannot take the free movement across the continent for granted – be it movement of people, capital or workforce. Unfortunately, sometimes instead of witnessing building bridges, we witness erecting walls between European countries. We chose Eastern Partnership as a focus of the thematic conference, because this is the region where the issue of borders is currently more relevant than elsewhere, and naturally, because Armenia is a part of EaP, so this is an opportunity to speak up about the problems of different kind of borders in the Eastern dimension of the EU. GT: You are both not from EaP countries. How much do you know about the EU’s Eastern Partnership strategy? Marlène: I am currently in the last year of a triple diploma between the UK where I specialized in Post-Communist Politics, France where in Sciences Po, in Lille, I passed my Master in European Affairs – and in Hungary where I study now, specializing in Eastern European Politics. As you can see, my knowledge of EaP was mainly academic before I discovered AEGEE. However, the Eastern Partnership Project of which I am now Project Director helped me to foster a more practical knowledge, to travel and see from my own eyes the EaP regions. This knowledge has opened opportunities to me: for instance, I will be directly working in Tbilisi at the French Embassy on EaP-related subject very soon. Natalia: Honestly, I knew little about EaP before the open call for the EPM topic proposal. But when I got to know Marlène and we started working on it in details, I felt EaP is what I want to focus on. A month later I ended up giving workshops on the topic and writing my Bachelor thesis about the Evolution of EU’s EaP. I am Russian and here not many people know about the existence of EaP at all. And when they do, they are rather skeptical, because EaP operates in a region we traditionally have close ties with. So, this is exactly what I would like to alter: first, raise awareness, second, help form a well-grounded attitude towards this initiative. GT: Have you both been to Caucasus before? Natalia (laughing): Only to its northern part, in the Russian part of the Caucasus mountains. Marlène: I have been to every EaP country including South Caucasus except Azerbaijan – I plan to go after I finish my internship in Georgia. It is interesting that Natalia visited the part of Caucasus I’ve never been to, it illustrates the different of point of view, which allows and enables AEGEE to act as an agent for borderless discussions and identity. Natalia Klimenko during a workshop at NWM Sankt-Peterburg. GT: What has AEGEE been doing in the EaP field so far? 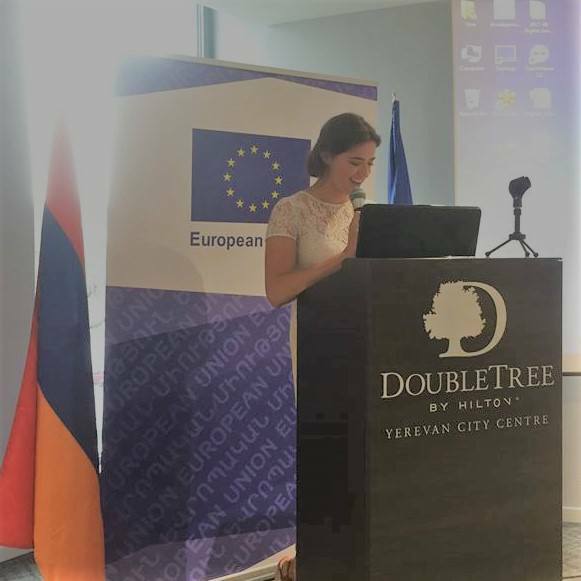 Marlène: AEGEE-Europe’s Eastern Partnership Project was created to ensure equal opportunities for young people in the East and improve a better exchange between the locals and members of Armenia, Azerbaijan, Belarus, Georgia, Moldova and Ukraine and the rest of the network. Countless activities have taken place over the seven years of existence of the EaP Project: from Action Days to conflict resolution events, from mobility conferences to Summer Universities. This year Action Days were organized in Russia, Georgia, Armenia, in the Netherlands, Germany and France. We focus more and more on the discussion of EaP-related issues within the network. In summary, the project is built on three main pillars: youth mobility in education, conflict resolution and active citizenship. The EPM topic “Borderless Europe – Can we dream that big?” it is the proof that we, as a network, can overcome and discuss issues nation states can’t. GT: Natalia, at NWM Sankt-Peterburg you gave a brilliant workshop, which revealed that many members of AEGEE in Eastern Europe don’t feel European. Were you shocked by the result? And what role will aspects like this play in the EPM conference? Natalia: The workshop was exciting, indeed, for both EU and non-EU citizens, and I would like very much to have a similar session at the EPM. As for “not feeling European”: I was a bit disappointed, but it was no news. I will not speak for Ukraine and Belarus, but in Russia it might be partially attributed to the artificially created division between the “Russian” way of the life and the “European” one, which might be beneficial to some stakeholders and fits in quite well in the life of a majority of Russia’s population. People do not understand that Europe is where Russia’s religion, political and economic systems, art, and technologies have taken inspiration from. On the other hand: for vacations, everyone goes to Europe and only a tiny part goes to Asia. The good news is, the sense of belonging to Europe can evolve gradually. This is what working on the European level of AEGEE or being a participant at international events can bring you. When I started to work in AEGEE’s international team, my sense of “Europeanness” doubled. Now I feel, if you ask, equally Russian and European. Marlène Rene at Agora Catania. GT: At the Agora some people criticized on stage that the presented content was very broad and maybe too ambitious for just 1.5 days. What’s your opinion about it? Marlène: “Borderless Europe, can we dream that big?” might be a broad title, however the theme is very specific: Borders issues in EaP states. It was very important for us to underline that borders were not only physical, but were mental also. It aims at creating a mutual understanding between young Europeans, who will gather not only to discuss different viewpoints and foster understanding that our vision for the European project is shared; it is also showing that whatever problems we may face, they could be overcome. We hope to start an important discussion on this specific subject with specific examples in the EaP regions. I don’t understand why it is a problem as this type of theme has been a great success in equally long conferences. On the contrary, in past successful examples the subject was even broader, because it did not focus to EaP region. For instance, the great conference of the “Your Vision for EUrope” project in Cluj-Napoca one year and half ago was a marvelous success. So why stop this effort that can bring impact both internally and externally? GT: How will the members and bodies of AEGEE be able to contribute to it? When will there be an open call for content? Marlène: There will be one very soon, just after the draft agenda including the other part of EPM is settled. Although we are content managers, we do not create the content for the workshops, we encourage bodies to create it and to discuss the theme. The EaP Project and the European Citizenship WG are motivated to take part of course as we were the ones writing the proposal, but we also want other bodies to bring in their expertise. We also invite experts to inform the members about the issues before they can give their input during the workshops. Eventually, they will have the knowledge and critical thinking necessary to understand the issue and question policies and defend solutions for different borders issues from mental to economic and physical ones. Natalia: Together with the link for the Open Call, we will publish a PDF with recommendations on topics that the prospective workshops and sessions could deal with. We definitely invite bodies and locals from different parts of Europe, from East to West, to bring brand new ideas and be creative! GT: In the past the often brilliant EPM conferences were not reflected in the Action Agenda planning part. Will it be different this time? And how could it be achieved? Marlène (laughing): It’s not an easy question because you frame it in such a way that the thematic part should be reflected in the Action Agenda. However, if I am not mistaken, they are a different part of the EPM. All we can do is encourage members through the thematic part of the EPM to consider those issues while they are planning the Action Agenda. Moreover, I hope that members interested both in EaP issues and the importance of borders will be the first to come to EPM Yerevan, and even to Tbilisi before that event! GT: Will there be a follow-up to this EPM topic in the network in 2018? For example, in terms of a European project with conferences and study trips? Marlène: On the EaP part, we have lots of plans from a study trip to Georgia, to more cooperation with Russia. We have so many projects and opportunities, we decided we needed more members to participate so that we could make our project stronger. Get ready, because soon we will have an open call! The EPM will be an opportunity to create even tighter ties between EaP countries, to raise awareness on the EaP regions and to organize more events all over the network. But that’s not all. 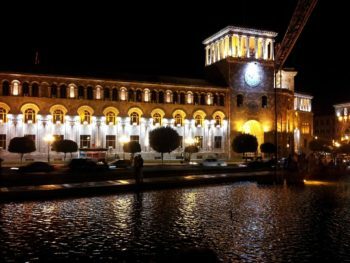 AEGEE-Yerevan and several Turkish locals are pushing for a new project on Turkish-Armenian talks; and we hope AEGEE will take the opportunity to push forward renewed discussions of Russia-EU talks. Natalia: In the European Citizenship WG we are already working, together with a well-known local, on a big conference with a very relevant topic that is going to take place in March, and on the planning of study trips to EU institutions, which we will strive to make available and affordable to non-EU citizens as well. So, stay tuned, as an update will follow very soon! Marlène and Natalia: EPM Yerevan is a one-in-a-lifetime opportunity to discover Southern Caucasus. The board of AEGEE-Yerevan is working day and night to accommodate everyone is the best way. It won’t be just an event, but a region full of surprise. It’s time to dream bigger! Also, if you are interested in EaP issues, the Eastern Partnership Working Group is lauching an open call too! So many opportunities to know more about the region, so take it! From 6th to 10th of February 2019 Izmir will be the centre of the AEGEE world. Around 100 participants will gather for the European Planning Meeting (EPM), which will focus on the issue of sustainablity this year.